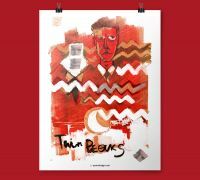 Twenty-five years after Twin Peaks: Fire Walk with Me debuted at the Cannes Film Festival, director David Lynch will return to the Croisette with a continuation of the Laura Palmer mystery. It was announced today that Showtime will preview screen the first two parts of the “18-part feature” at the 70th anniversary edition of the festival which kicks off May 17, 2017. Ever since Showtime announced the May 21st premiere for Twin Peaks, it’s been noted that the timing would be perfect for a world premiere at the prestigious film festival. A date for the screening hasn’t been announced yet, but the festival runs May 17 through 28. Monica Bellucci, who is part of the new cast, is the festival’s Mistress of Ceremonies. Other special guests in attendance are to be announced. UPDATE: The first two parts of the new Twin Peaks (2 x 56 minutes) will screen on May 25th at 7:30 PM. Cannes premiere is after the U.S.
Hat tip to Ross Dudle for that update. I hope it is shown after the Showtime debut. So critics don’t spoil anything. Cannes’ is on the 17th, the premiere is on the 21st. I’m probably gonna stay off the internet and rewatch the first two seasons during that time. Oh missed the part where the festival ran passed the 21st. My mistake. Here’s hoping! I could kiss your pointy little head ! I have a venture that I’m simply now working on, and I’ve been at the glance out for such information.